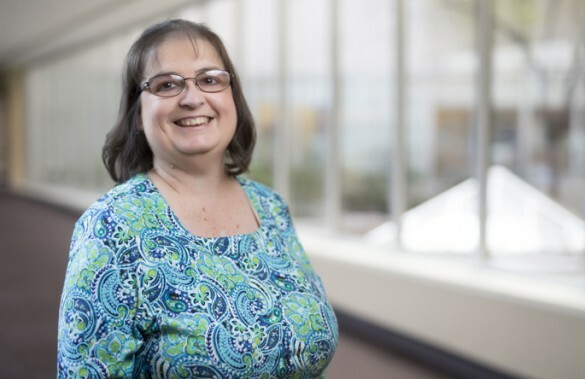 On Nov. 24, Vanderbilt University Medical Center patient Pam Smith will have a low-key lunch with a longtime friend to celebrate reaching 25 years post transplant. As the longest surviving single-lung transplant patient in the United States, and the second known in the world, Smith also plans to release a balloon in honor of the donor who saved her life. “I have always thought about having some kind of celebration, but it’s a tough time of the year with the holidays and all,” said Smith, 51. “I am just so thankful for the second chance. I think about the donor family all the time. Smith admits she did not think she would see this milestone. Vanderbilt Transplant Center’s (VTC) first lung transplant was performed in 1990. Smith was the program’s fourth transplantation. Diagnosed with pulmonary arterial hypertension (PAH), a rare lung disorder caused by an elevated blood pressure within the pulmonary arteries, Smith was first listed for a double-lung/heart transplant. But after nearly a year on the list, her doctors moved her to the single-lung transplant list. Three months later she got the call. “Dr. Loyd would periodically call and check on me,” recalled Smith. “When he called the day after Thanksgiving asking when I last ate and what I ate, it never dawned on me that he was calling because of my lung. “When he told me he thought they had a lung for me, I was kind of cool and all on the phone until I hung up. Then I cried. We made it to Nashville in two hours that night,” said Smith, of Athens, Tennessee. Although Smith had a single-lung transplant, standard therapy for most PAH patients today is a double-lung transplant, which was not available until 1994. Single-lung transplantation for PAH was considered a “radical medical concept” in 1990, according to James Loyd, M.D.,professor of Medicine and the Rudy W. Jacobson Professor of Pulmonary Medicine. “Pam’s course is a testament to innovative and talented surgeons, especially Drs. Bill Frist and Walter Merrill, who were willing to adopt newly evolving approaches as needed to benefit patients with life-threatening illnesses. “Pam is our hero, for her careful manner in which she has managed her own medical problems, while simultaneously inspiring dozens of other patients throughout the years,” added Loyd. Mark Steele, M.D., medical director of the lung transplant program at Vanderbilt, is one of Smith’s physicians. “It is extraordinary,” Steele said of the 25-year milestone. “I’ve taken care of about 1,500 lung transplant patients in my career and she is the only one who has survived this long. “She is a very good patient and she carries a lot of that success on her shoulders. She has done exceptionally well and is very good about asking questions and staying on top of her health. Steele cites a one-year survival rate of 95 percent for Vanderbilt’s lung transplant patients, which is above the national average according to the Scientific Registry of Transplant Recipients (SRTR), a national database that tracks patient outcomes for all transplant centers in the U.S.
VTC data shows that since the start of the lung transplant program in 1990, 401 transplants have been performed. In the program’s first year, there were five. VTC is on track for the largest lung transplant volume this year. A record 26 transplants have been done. There are six patients currently on the waiting list at Vanderbilt. Survival rates for lung transplant typically begin to taper off after the first year, said Steele. Vanderbilt’s three-year survival rate is 75 percent while the five-to six-year survival falls around 50 percent. Pharmaceutical therapy combined with transplant can prolong patient survival. “We have had incremental improvements in survival related to better surgical techniques, better matching criteria and immunosuppression, and infection therapy has much improved,” Steele said.